IRON MOUNTAIN–A local circuit judge has recently announced he’s retiring from the podium. He’s presided over Dickinson, Menominee, and Iron Counties for 17 years. In his youth, Richard Celello always knew he had some interest in law – it all started with a TV show that inspired him to pursue a career. 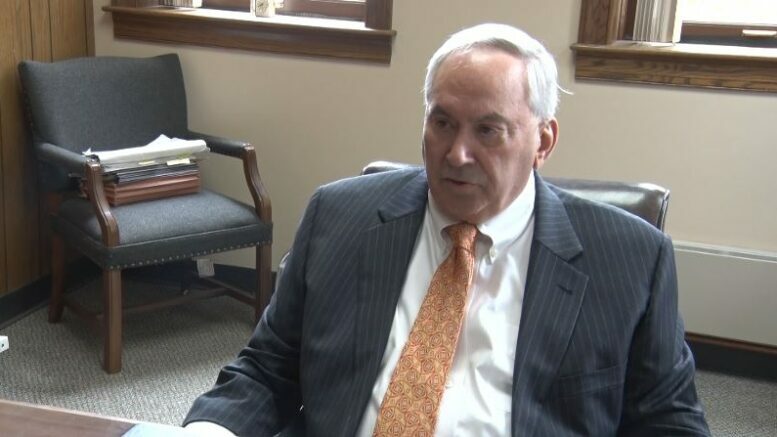 From his beginnings as a trial lawyer, to being elected to the district court bench and eventually working his way to the circuit court podium, Judge Celello has always been well recognized for his work over the last 44 years. He’s worked on a wide variety of cases, from civil disputes to murder. “Well, I started practicing here as a young lawyer in the circuit before then Judge Brown, and so I cut my teeth trying cases here in the circuit Iron Dickinson, and Menominee as a young trial lawyer,” said circuit court Judge Richard Celello. Judge Celello was appointed to the circuit court in 2000, and was elected to serve three, six year terms. Recently, Celello has felt that it was time for him to leave the bench behind, ahead of his term end date in 2018. He says he wants to spend more time with his grandchildren. Looking back at his work as a judge, Celello says there’s one recent case he was proud to work on. And from the public’s reaction, it sounds like they are proud of his work, too.